When it comes to ensuring that each and every dishwasher load you complete ends with flawlessly clean and streak-free dishes, you’ll want to include rinse aid as a part of your regular dishwasher regimen. Dishwasher rinse aid is designed to help you get spotless results from your machine. It enhances the drying process and protects your glassware from etching. Almost every modern dishwasher available today features a dedicated dispenser for rinse aid. How does rinse aid work? The ingredients in rinse aids are designed to reduce the surface tension of the water used in your dishwasher’s cleaning process. Why is this an effective method? It all comes down to the science of how water condenses and gathers. By reducing the surface tension of water droplets, those droplets lay flat instead of forming rounded beads. This exposes the water’s surface to more air, causing it to dry more effectively and drain more quickly. As a result, water spends less time lingering on your dishes which results in dishware and glasses with fewer spots, film and left behind markings. What will happen if I don’t use a rinse aid? While the results of not using regular rinse aid in your dishwasher will likely not be catastrophic, it can have a noticeable impact on the quality of your dishwashing cycles and the long-term appearance of your dishes. If you don’t use rinse aid for dishwashing cycles, your dishes will still dry utilizing the heat from the dishwasher’s dry cycle. However, you might experience water spots from water lingering for too long on each dish. This can be particularly apparent (and devastating) on fine china and expensive, high-quality glassware. In the short term, glasses will come out looking less shiny, sparkly and clean. Over time, failure to use rinse aid can even result in permanent scratching, marking and etchings. Don’t take your chances—use rinse aid to ensure the best dishwashing effectiveness and safety for your most prized dishware. The detergent tabs I use feature a layer of rinse aid. Is that enough to get the job done? Many supermarket variety brands have introduced detergent tablets featuring rinse aid built-in. While this might be a good temporary solution for everyday use, built-in rinse aid dispensers featured on modern dishwashers can work better as they regulate the timing and volume of rinse aid being released into the dishwasher during a cycle. If you’re willing to take a few seconds to fill up the rinse aid dispenser in your dishwasher from time to time, the results will make it worth your while. Will rinse aid also help dry my plastics more effectively? You might observe that plastic items including Tupperware still have water beads leftover after a dry cycle. This is because plastics are “hydrophobic”—this means they are less likely to attract to water and take longer to dry compared to glass surfaces. Don’t be alarmed if your plastics still have beading water left behind when using rinse aid—this is relatively common and won’t damage your plastic items. Is Vinegar an effective natural alternative to rinse aid? Many dishwasher users wonder whether they can substitute white vinegar for rinse aid for a natural, cheap alternative. In this case, white vinegar with 5% acidity or less is a suitable substitute for rinse aid, at least when it comes to water spots and better drying. However, vinegar will not make your dishes any shinier in the way that rinse aid has the power to do. If you want the absolute highest level of wash quality and that high-end sparkle for your glassware, we recommend using a rinse aid in your dishwasher. Based on all the data available and our research, we highly recommend using a rinse aid in any modern dishwasher. It’s safe for dishes, enhances drying effectiveness, water spots and etching reduction, and results in a beautiful sparkle for your dishes. 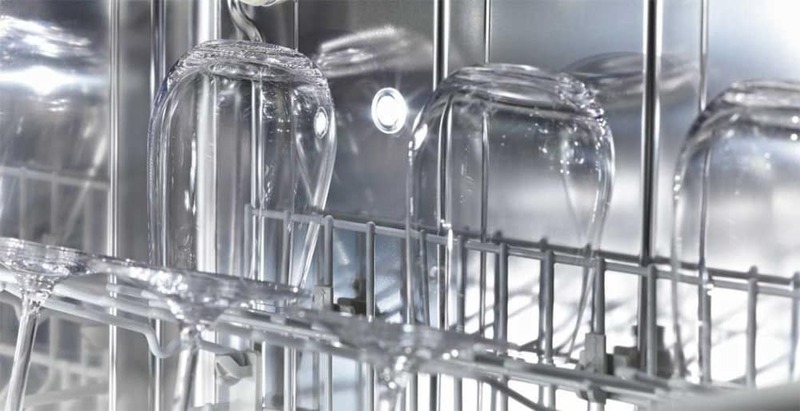 The most consistently effective rinse aid we have tested comes from Miele, a highly rated dishwasher manufacturing company that certainly seems to know their dishwasher accessories. You can find their rinse aid here: Miele Rinse Aid. Do you recommend a particular dishwasher for best drying performance? Choosing a dishwasher is not trivial. There are many factors to consider besides drying performance, such as cleaning ability. We covered all of these factors in our latest dishwasher buying guide.